Celebrating Hannes Schneider, A Pioneer Of Alpine Skiing In North America. 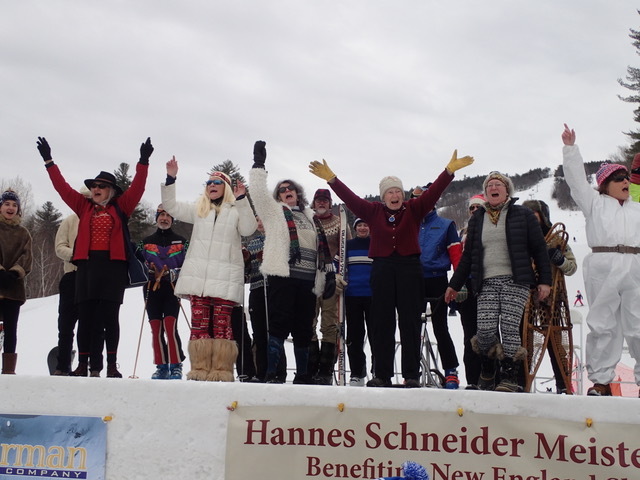 Every year, the Hannes Schneider Meister Cup Race, sponsored by the New England Ski Museum and Cranmore Mountain, NH, celebrates the legacy of the venerable Austrian ski instructor. For 23 years, the Cup has drawn people to Cranmore from all over to race or just cruise on this low angle dual slalom course on the Alley, where the old Skimobile ran up. This year’s March event poignantly marked the 80th anniversary of Schneider’s arrival via the Eastern Slope Express 7 a.m. Feb. 11, 1939 at the railroad station that still sits in downtown North Conway. Any major ski resort in the US would have been thrilled to hire Schneider as ski school director, but he chose to make Cranmore his home. His family followed him into the ski business and now four generations of Schneiders are part of the family narrative. At the recent festivities, great grandson Hannes Schneider dedicated a plaque to his grandfather, Herbert Schneider (Hannes senior’s son), who served in the 10th Mountain Division and also owned Cranmore from 1963-84. His goal had been to make sure every kid in the valley had a chance to learn to ski. The organizers went all out. The weekend started with a reception and hearty dinner at Zip’s (Hannes’ nickname) Pub & Grill and torchlight parade. 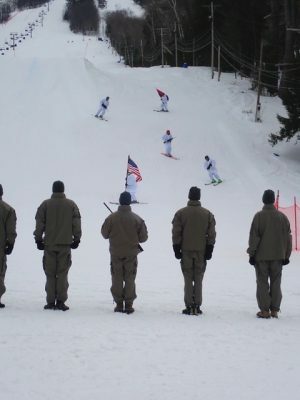 It continued Saturday morning at Cranmore’s base with dedication ceremonies, a vintage ski fashion show (one winner rifled through her mother’s closet for an award-winning outfit), silent auction, awards ceremony, bratwurst and beer, all serenaded nonstop by the oompah music of the Bavarian Brothers Band. One felt quite transferred to Austria, instead of a quaint North Conway. All proceeds went the New England Museum, the goal being to preserve the rich ski history in this region. Schneider’s story is an intersection of politics and skiing. Here’s the short version. Hannes Schneider ran a ski school in St. Anton Austria, where he promoted the new Arlberg technique and helped bring important tourism business to the region. As a high-profile critic of Hitler, he drew ire from the Nazi party who threw him into prison. 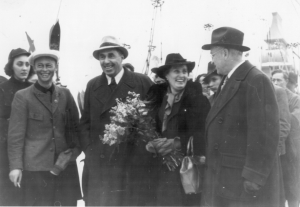 With the intervention of a German skier friend who was also an attorney, and Harvey Gibson, an influential American banker, Hannes eventually found refuge in the US where Gibson set him up as ski school director at the new snow-train-served resort Gibson opened in North Conway. 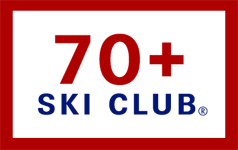 For competing in the Ski Meister Cup, or any ski race, here’s general advice for seniors. If it’s a fundraiser for a worthy cause, it’s easier to justify having more youthful competitors heartlessly whiz by you on a parallel GS course. In North Conway, visit the Eastern Slope Branch of the New England Ski Museum, opened only a year ago, a companion to the one in Franconia. Click here for more on skiing at Cranmore Mountain. 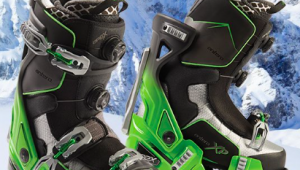 Click here for Cranmore’s website. I’m very proud to say my father Albert Bornstein taught for Hannes In St. Anton am Arlberg, Austria the original Arlberg technique before also scaping from Austria due to Hitler.